When Karen Glander was just one year old, she was infected with the Polio virus which affected her right arm and left leg. Then at age 40, she was diagnosed with post-polio syndrome, meaning the earlier affected muscles began to further deteriorate She now only has the use of two fingers on her right hand and uses a full leg brace on her left leg at all times, as well as a power chair in public. Her doctors suggested an assistance dog to help her find more independence at home while her husband was away. So she applied to Can Do Canines in 2013 and was matched with Mobility Assist Dog Erma, a Yellow Labrador Retriever. They were a wonderful team, and Karen enjoyed feeling safe and comfortable home alone for the first time in a long time. Unfortunately, all good things must come to an end. Erma was diagnosed with cancer in 2017 and sadly passed away in August. Karen needed time to grieve, but also realized how much she came to rely on an assistance dog around the house. So Karen applied for another Mobility Assist Dog from Can Do Canines in late September of 2017. About two months later, she was matched with Austin, a Black Labrador Retriever. Austin is known as a successor dog because he is not Karen’s first assistance dog. Many clients have numerous assistance dogs throughout their life, each with their own unique personalities and strengths. Austin assists Karen with many of the same things that Erma did like open the fridge, retrieve the phone if Karen needs it, activate handicap-door buttons, pick up her cane when Karen drops it, and carry around a small basket in which Karen kept some essential items. He also brings towels around the house to put them in a laundry basket which he then tugs over to Karen so she can put them in the washing machine. While he works as hard as Erma did, Austin is a bit more affectionate and matches Karen’s energy in a special way. He likes snuggling with Karen, especially in the afternoons and evenings. Because Can Do Canines provides its assistance dogs free of charge, it makes many matches that wouldn’t have otherwise happened. 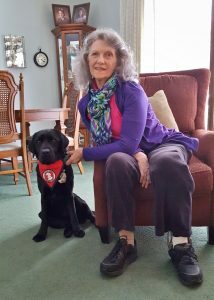 Karen says, “There is no way I could have afforded [an assistance dog].” Thanks to our donors and volunteers, Karen is able to continue living with a canine helper.